El poder entregar un periódico politizado y poder debatir de tú a tú con la persona a la que se lo estás regalando. 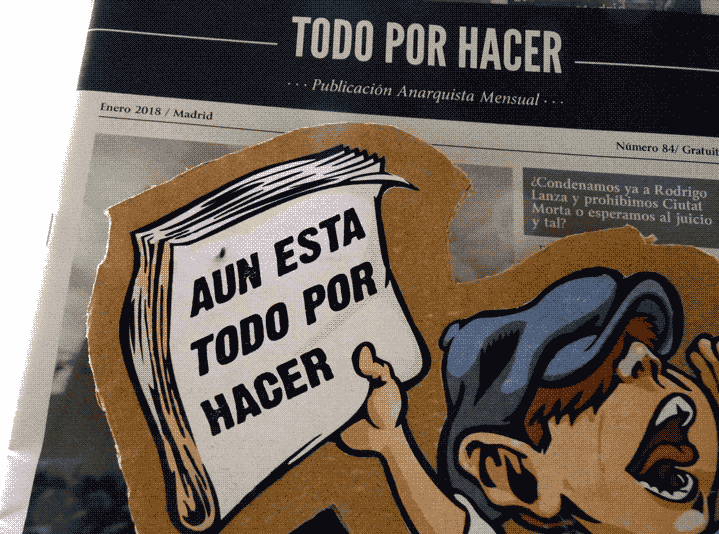 Todo por Hacer (which in Spanish literally means Everything to be Done) is a free anarchist monthly newspaper which is written, edited, printed, and distributed in the city of Madrid (Spain), although there are collaborators who take it to other cities of the State. With our form of distribution we value the exchange in person, the free handout in the street and at our usual distribution points (social centers, bars, bookstores, etc). There is something very rewarding in delivering a politically-focused newspaper and being able to discuss its contents with the person to whom it is given, as equals. Todo por Hacer was born in February 2011, created by a handful of people full of hope, willing to push forward a self-managed project that would provide important news each month with a critical and anarchist perspective. Those were the times of the general strike of 2010, of the outbreak of May 15th movement and the “indignados” demonstrations, of the development of the housing movement and of the general strikes of 2012. We had social and class struggles on the street and we would put down our thoughts and contributions on paper and go out and give out thousands of copies of our 16 pages. With this we also showed that paper is not an obsolete or anarchronistic means of information in Western Europe, but a valuable way of communication that lasts to this day. The great demonstrations that took place a few years ago no longer occur and, consequently, although we continue to draw every month a circulation of 2,000 copies, we have also increased our presence on the Internet, both on our website (www.todoporhacer.org), as on social media. Otorgamos prioridad al análisis sobre la novedad y, frente la dictadura de la "inmediatez" y del "titular jugoso" que tiene secuestrada a la prensa generalista, contamos historias que nos inspiran o nos indignan, pero sobre todo que mantienen su vigor e interés con el paso de las semanas y de los meses. We give priority to analysis over novelty and, in the face of the dictatorship of "immediacy" and the "juicy headline" that has taken over the general press, we tell stories that inspire or outrage us, but above all maintain their vigor and interest with the passing of time. With our tool, we complement other activist, anti-capitalist and anti-authoritarian media, providing paused reflections in the face of the massive amount of information available online. de expresión, de antifascismo, de liberación animal y de un sinfín de temas. In all this time we have talked about social struggles, feminism, self-organization, repression of activists, environmentalism, freedom of expression, anti-fascism, animal liberation and a myriad of issues. Volcamos todo nuestro esfuerzo en que nuestras palabras y las de nuestras colaboradoras lleguen a tus manos todos los meses por diferentes canales. Todo esto de forma gratuita, sin publicidad que nos condicione y de forma militante sin recibir un sueldo a cambio. Los gastos de imprenta suponen 500€ mensuales (6.000€ anuales) de los cuales cubrimos la mitad con suscripciones y cuotas solidarias. Por este motivo hacemos un llamamiento a la solidaridad, a que aportéis lo que buenamente podáis, para que este medio pueda seguir existiendo y para que podamos seguir informando sobre las luchas de compañeros y compañeras en nuestro contexto y seguir avanzando. Printing costs amount to 500 euros per month (6,000 euros per year), of which we cover half thanks to subscriptions and solidarity fees. 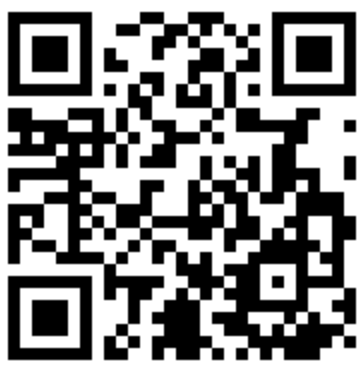 Now we need your help to keep on moving forward. For this reason, we call for solidarity, which can help us find a way to keep on publishing and reporting on the struggles of our comrades. bitcoins serán transferidos directamente a las activistas sin cuota de plataforma. Por el momento no es posible el reembolso de bitcoins. En esta campaña todos los bitcoins serán transferidos directamente a las activistas sin cuota de plataforma. Por el momento no es posble el reembolso de bitcoins. Leer más sobre nuestros términos.